w/ Original Boxes-Cases & Authenticity Papers. Directions: From Hanover square follow Broadway 1 block to traffic light. Turn right onto York St. Follow 1 ½ miles. Turn right at traffic light at Cooper Motors onto Blooming Grove Rd. Follow 2.9 miles. Turn left onto Dubs Church Rd. Follow 3/10th mile to sale site on right. Sale Preview: Friday Aug. 10 = 5 p.m. - 7 p.m.
Gold & Silver Proof Sets: 1995 American Eagle 1oth Anniversary proof bullion coin set w/ $50 gold coin-$25 gold coin-$10 gold coin-$5 gold coin & silver dollar, 7=1992 American Eagle gold bullion 4 coin proof sets, other gold & silver proof sets including 1993 Philadelphia 5 coin set, 1991 Mt. Rushmore Anniversary 3 coin set, 1995 Civil War Battlefield Commemorative Coin set, 1993 Bill of Rights 3 coin set, 1992 U.S. Olympic 3 coin set, 1987 U.S. Constitution 2 coin set, 1993 Bill of Rights Commemorative 6 coin set, 1988 U.S. Olympic 2 coin set, 1994 World Cup USA Commemorative 3 coin set, 1991-1995 WWII 50th Anniversary Commemorative 3 coin set, 1992 Columbus Quincentenary 6 coin set, 1886-1996 Smithsonian Institution 150th Anniversary Commemorative 4 coin set. 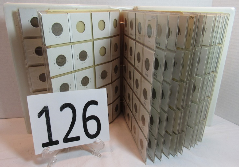 Silver Sets: 5=1996 U.S. Olympic coin of Atlanta Olympic Games Prestige 7 coin set, many other Prestige sets, Premier sets, silver proof sets, silver eagle coins, much more. Please Note: This COIN Auction to held in another room from other auction we are running the same day at this location. NO Buyers Premium on this coin auction. Sale Terms: NO Buyers Premium. Cash & Pa. Local Checks Only. 3% Fee when Paying with Mastercard & Visa.